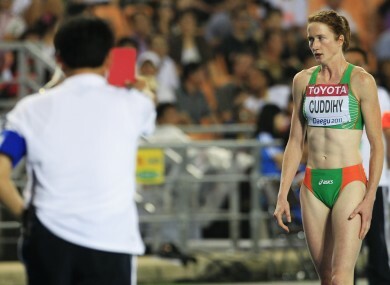 Joanne Cuddihy reacts following her disqualification in the 400m semi-finals. THERE WERE PLENTY of talking points on day two of the IAAF World Championships, with gold medals handed out in six events, including the much-anticipated men’s 100m final. Here’s everything you need to know about today’s action in Daegu. Tori Pena (Pole Vault): American-born Tori Pena couldn’t manage to qualify for Tuesday’s pole vault final. After clearing her opening height of 4.10 metres, she failed three times at 4.25. Mo Farah (10,000m): One of Britain’s major medal hopes for the 2012 Olympics, Farah looked to have won the 10,000m gold only to be overtaken by Ibrahim Jeilan of Ethiopia in the final strides. Yohan Blake (100m): Two years after testing positive for the stimulant methylhexanamine and missing the 2009 World Championships, the 21-year-old Jamaican hit the headlines for the right reasons, winning the marquee 100m final in 9.92 seconds. Usain Bolt (100m): The world was watching to see if the Jamaican superstar could reproduce the heroics of Berlin 2009, but with Asafa Powell ruled out through injury, Bolt’s false start and disqualification meant that the final was contested without the two best sprinters in the world. Joanne Cuddihy (400m): After running a season’s best yesterday to qualify for the semi-finals, today’s disqualification was heartbreaking for the Kilkenny woman. Kenenisa Bekele (10,000m): Before today, the 29-year-old Ethiopian had never been beaten 0ver the distance. However, pre-race concerns about his fitness proved to be right as he was forced to pull up not long after the halfway point. Email “Daegu days: False start rule ends Cuddihy's challenge”. Feedback on “Daegu days: False start rule ends Cuddihy's challenge”.